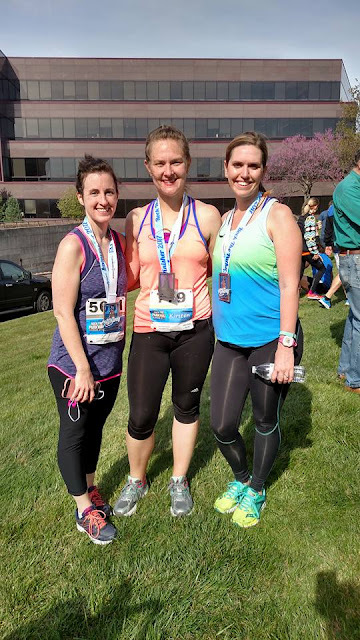 Two weekends ago I ran my 8th half marathon! I hadn't ran a half marathon since fall of 2013 so in a way it was like starting over. I still remember in Myanmar when Pam asked me if I thought getting back into crossfit and fitness would be hard and I said I didn't think it would be. ha ha ha ha! It was so hard! When I started running again last fall I was at a 12ish minute mile and my legs felt like tree trunks. Then I threw in crossfit into that mix and that added another whole new dimension of difficulty! But you know what? With time I got stronger and faster and it paid off because I ran 13.1 miles. I want to give an overview of my training and the details on how the race went. 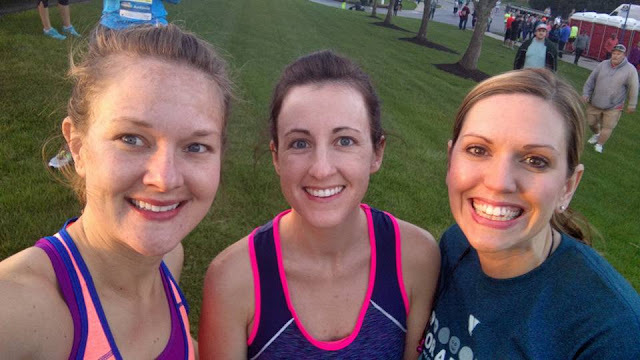 For this training plan I used my running book to look at their half marathon schedule. I used that as a base to get ideas and then tailored it to my specific needs. I decided to run three times a week with runs consisting of a tempo run of either 3, 4 or 5 miles on Monday or Tuesday, speed drills and a long distance run. I also added in crossfit and some intense stretching into the mix as well. I did well with crossfit for the first few weeks but after traveling to New Mexico twice and then taking a 13 day vacation with Dave I pretty much fell off the crossfit wagon for the last half of my training, and I'm okay with that. I am really proud of myself for how I did with my training. For my tempo runs I often would try and beat my previous run of that same distance. For example, one week I would run 4 miles and then a few weeks later when I had a 4 mile run again I would try and beat my previous time. It was a good challenge, kept things interesting and I think it helped me shave off time from my mile. For speed drills I tried to change it up every week. One week I would use the plan from my running book but shorten it a bit. I also used these ten minute treadmill drills that I found on-line and I really liked them! Those drills also majorly paid off because the race course had a lot of hills. The majority of my speed drill runs were done on a treadmill and for some reason I like treadmill drills. It's kind of sadistic but I like that I can set my pace really fast and can't slow down unless I manually push a button. The long runs mentally got easier over time but oh my word, they were torture in the beginning. My first long run was 5 miles and I thought I would die. Actually the first three long runs were really mentally hard and then it started getting better. My longest run was 11 miles and I did that at Pensacola beach (paved sidewalks) midday. Not the brightest idea I have had but it was really pretty scenery. I also did an 8 mile run in Little Rock, AR by the river and that was beautiful. I missed one long run and shortened one and still did fine in my race. I tried not to beat myself up over missing a run but I also tried to get every long run in that I could. Our run was Saturday morning so we headed up to Kansas City on Friday afternoon. For dinner we ate at the Cheesecake Factory and I did not have pasta but I did indeed eat a big fatty steak with lemon cake for dessert. It was the perfect pre-meal. Race day morning we got up at 5:45am. For breakfast I had bacon a few bites of bread and some coffee. Before any big race I get extremely nervous and want to cry - so weird. The race course was very hilly and we started up with a three mile hill incline. It was brutal but somehow Shenel and I ran the first four miles with a sub ten minute pace. I think it was adrenaline and I also think those speed drills on the treadmill paid off right there. Shenel and I ran together for the first 6.5 miles and then I was a bad friend and ran ahead of her. =) I honestly ran without stopping until mile 7.5 when all I could see was a never ending hill and I had to walk up a little bit of that hill. At mile 10.5 I called Dave and told him I needed motivation to finish this race because I was done and he said he would buy me flowers. The race course said the last three miles were all down hill and that was a big fat lie. Mile 10 and 11 were super hilly but mile 12 to the finish line was a steady decline which was awesome! My total time was 2:13:09 with an average pace of 10:09 minutes miles, which I think is awesome for hills, water stops and a few minutes of walking! I'm already thinking about signing up for another half marathon this fall to see if I can shave more time off. BUT before I do that I have started training for a race over Memorial Day weekend. It's a race called 'Get your rear in gear' and it honors those who passed away from colon cancer. They have a 5k run which I'm hoping to do in 26 minutes and if you aren't a runner they also have a mile walk. It's on Sunday evening at 7:30, which I'm so excited I don't have to get up early for this run. We have a team set up in Dave's Mom's name, Carol A. Johnson, and we will run it in memory of her. If anyone is interested in joining our team you can do so here. Lastly, I don't say this to scare anyone, but one of the runners on the course of our half marathon in KC collapsed after he crossed the finish line and passed away. You can read the article here if you are interested. I have thought about him and his family every single day since I heard that news. He was 34, an avid runner with no apparent health problems. I don't even know how to respond to that kind of news I just know that you have to be ready to die at any moment. Please pray for his family if you think about it. If you have any questions about my training, race, etc. please let me know in the comments below. Congrats!! I love your colorful page with all the miles run--a rainbow of awesomeness! Woo! Awesome job and I love your training page that you colored in! It looks so cool. The next time I train for a race I want/need to do more of actual tempo, slow, and medium runs and not just run the same every time. I'm sure that did help a lot with all the hills! First off, I love your bullet journal, it is so cool! Secondly, great job on completing another half marathon! Every time I get back into running after a break, I DREAD my first run that is over 3 miles. I can totally relate to the struggle of a 5 mile long run. It's hard to get back into a "long run" frame of mind. Also, I read this post yesterday and I also read the article that you linked to about the runner that passed away after the race. I hate reading such sad stories, his family and friends have definitely been in my thoughts.